A dual laser guidance system provides added accuracy and safety. The top laser aligns fork tines with pallet fork slots to prevent damage to goods. 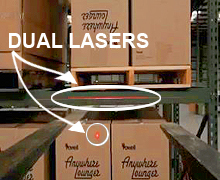 The bottom laser aligns forklift with pallet rack beam to avoid damage to the rack. 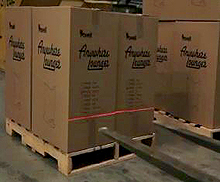 There are two main choices in how the laser system gets power: onboard rechargeable batteries specifically for the laser system, or directly wiring a laser's voltage regulator to the forklift's electric power source. Beyond those choices are also decisions on how you want the laser itself to trigger, or startup. A vibration switch circuit takes its cue from motion - the vibration caused by the forklift, or motion of the forklift being driven. When the circuit senses motion, it triggers the laser to turn "on". If there is no movement for more than 4 minutes, the circuit triggers the laser to turn "off". This type switch helps save laser service life and saves battery power. Height switches operate by sensing how high the laser is from its resting location. When 7' high is reached, the switch triggers the laser to turn "on" and remains on as long as the forks remain above 7' high. When the forks drop below that height, the switch triggers the laser to turn "off". This type switch has a two-fold purpose: 1) saves laser service life and battery life, 2) helps prevent laser light flashes from potentially damaging workers' eyes in high worker population work areas. RF or "radio frequency" controls work like the remote control key fob for your car. The controller (backed with 3M adhesive) is mounted to the forklift frame where it can be easily reached. A push of the button turns on the laser system to aid the operator in fork placement. A second push of the button turns the laser system off, saving laser life and batteries.